Communities in West Africa are frequently exposed to extreme weather events, such as intense rain that causes devastating flooding or prolonged dry spells that negatively affect livelihoods tied to agricultural activities. As part of the West African Science Service Center on Climate Change and Adapted Land Use (WASCAL) project, UNU-EHS organized a training on Risk Assessment from 13-15 July at the WASCAL Competence Centre (CoC) in Ouagadougou, Burkina Faso. The objective of the training was to communicate risk assessment methods and tools to researchers at the CoC, with the goal that the CoC will be able to provide a risk assessment service to West African stakeholders. The training brought together researchers from social anthropology, remote sensing, agricultural economics and climate science, among others. 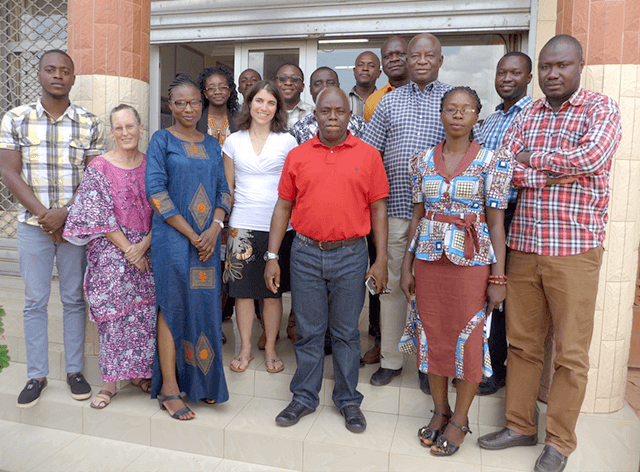 The CoC acts as a knowledge and data hub to strengthen local research capacity in West Africa. The Centre connects data collection networks, offers infrastructure and expertise for analyzing the impacts of climate change, conducts training and outreach activities, and provides a collaborative work environment for West African scientists. During the training researchers Dr. Daniel Asare-Kyei and Dr. Yvonne Walz presented research findings on risk profiles of different communities in Ghana, Burkina Faso, and Benin. These profiles were then used to explain how vulnerability to flooding and drought can be quantified and assessed. The hazard event database which houses hazard information for Benin, Burkina Faso and Ghana was handed over to the CoC during the training. As WASCAL provides a rare regional perspective of hazards, participants discussed the database’s potential to be implemented as a tangible and sustainable regional risk assessment service for the WASCAL member states. Countries could provide their hazard data and store it in the database while also having access to data from neighboring countries. As natural hazards such as flooding and droughts do not respect state borders, this could be a valuable resource for countries to manage and assess their risk. WASCAL is a groundbreaking project that combines international large-scale research, education and capacity development to develop effective adaptation and mitigation measures to climate change in West Africa. Funded by the German Federal Ministry of Education and Research (BMBF), WASCAL was launched in 2012 and comprises a large number of partners in Germany and West Africa.